Cook fusilli to desired doneness as directed on package. Drain; cover to keep warm. Meanwhile, heat oil in large nonstick skillet over medium-high heat until hot. Add shrimp; sprinkle with garlic salt and pepper. Cook 2 to 3 minutes or until shrimp turn pink, stirring frequently. Add canned tomatoes, fresh tomatoes, olives and fennel seed; mix well. Cook 2 to 3 minutes or just until thoroughly heated, stirring occasionally. Stir in fusilli. Sprinkle with parsley. Small to medium shrimp don't really need to be deveined, but they look prettier that way. The vein of large shrimp may contain grit so it must be removed. Fennel tastes similar to anise but sweeter and more delicate. As with all seeds, crush fennel in a mortar and pestle to release flavor before use. 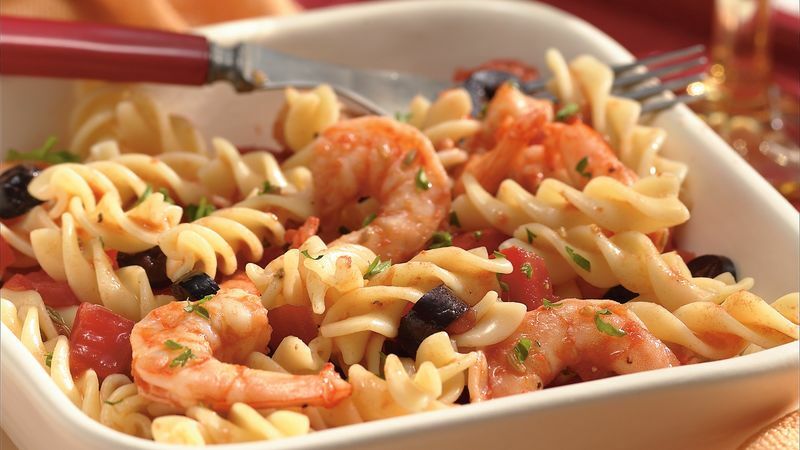 Frozen shrimp can be used in this recipe; thaw under cold water before use. A French baguette, tossed green salad and banana sundaes complete the menu.